Early checlout and transfer to BKK airport, where we leave our bags intended for our subsequent trip to China at the left luggage. It is a bit of a nuisance because they only accept local cash, Thai Baht, a bit complicated. The x-ray everything and tag it. They also ask to see our electronics first, possibly to ensure they are genuine gadgets and not explosives. 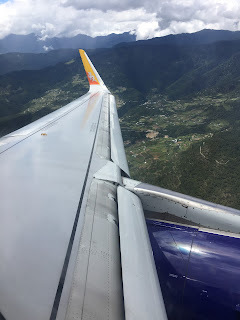 We land at Paro airport after a smooth flight from Bangkok which includes a stopover in the Indian city of Kolkata (the new name for Calcutta). Very few airlines fly to Bhutan, so the flight from Bangkok always stops in an Indian city to pick up passengers. 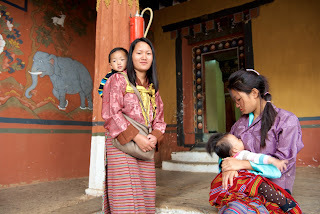 Many Indians go to Bhutan because they are the only foreigners (together with Sri Lankans I believe) who are allowed into the country without visa or currency exchange requirements. We would find out why in the course of our trip: Bhutan wants Indian labor to do its construction and soldiers to guard its frontiers. Paro hosts the only international airport of Bhutan. 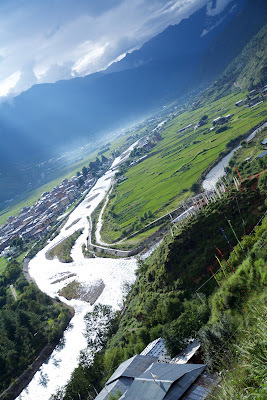 They will explain us that the king decided to build the airport here because he did not want to create noise pollution in the valley of the capital, Thimphu. I try to get window seat but no luck, yet when we board there are plenty window seats free, which is great to be able to watch the amazing landscapes of the Himalaya. Spectacular landing after a few tight turns by our plane as it finds its way among the mountains and into the narrow valley of Paro. On the plane we met our group. Diverse mix of nationalities, age, and cultural backgrounds. It was always part of the fun in taking these photo tours: you not only get to know the country you visit, you also learn more about your own country, or anyway about fellow Western middle-class internationally curious photographers. This time we have quite a few nationalities represented: German, French, Chinese, Italian, American, Australian and British, both for and against Brexit! Easy border formalities. Our electronic visa has been arranged in advance and we go through passport control quite smoothly indeed. At my request the lady officer agrees to enrich my passport with an unnecessary but cute rubber stamp. She even asks on what page I'd like to have it stamped on. Bags are quickly delivered to one of two luggage carousels in the cosy arrivals hall. Ours is the only plane on the tarmac in this balmy late morning. 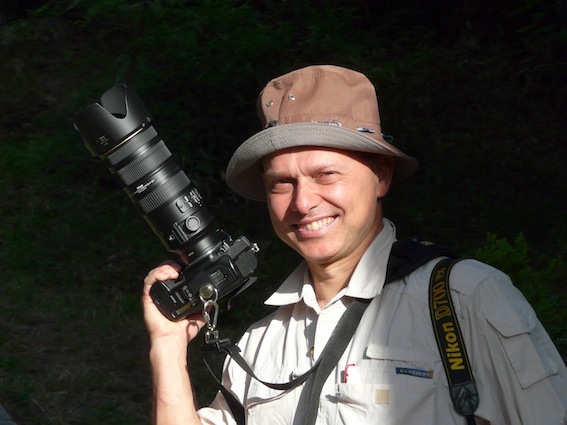 After a quick and relaxed x-ray check we are out into the tiny parking area where we meet Matt, an Australian photographer who has organized this trip as a roving photo tour of Bhutan. We also meet Tshering, our local Bhutanese guide, who will turn out to be very knowledgeable and speaks excellent English. We all go for lunch at a scenic restaurant near the airport. From the terrace of the restaurant you can see the runway. Not that it is a very busy, only a handful of planes land at Paro every day... if the weather is good enough, that is. Our first encounter with Bhutanese momo and other specialties. In the afternoon we visit the Paro Rimpung Dzong (17th century fortress) and arguably the most interesting sight in town. Lots of local and foreign visitors. One young lady was breastfeeding on the steps of a prayer room. I was happy people left her alone, I read many times recently how in the US and in Europe it was considered socially unacceptable for women to breastfeed in public. How silly. Afterwards we walked back down from the Dzong to town in a little less than one hour and went for some shopping for basic necessities along the main (only?) shopping street of Paro, a small town that sported rather heavy traffic of cars and motorcycles. 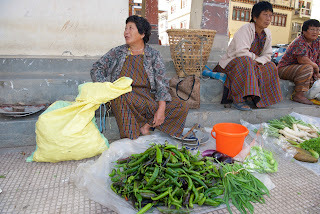 A few ladies were selling fresh produce on the pavement. In the evening we dined at the Sonam Trophel Restaurant, a traditional local eatery in Paro. It is run by a friendly couple and their daughter, they make local as well as Indian and Chinese food. He is a local but she comes from India. We would see how both India and China have, or have had, great influence over small Bhutan over the centuries. 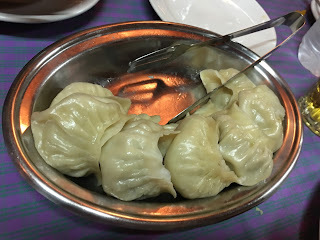 We went for local fare and were quite happy with it. Final task of the day is transferring to our accommodation, the Olathang, a 3 Star Hotel. Our first night in the supposedly happiest country on earth, we'll see, I am always skeptical of broad-sweep claims like that but the first impression is quite positive: a serene place.